With a full price that's equal to the industry standard, Sontronics' biggest challenge will be getting you to put down the 57, but the Halo is a worthy competitor. Frame and springs. Competition from Shure SM57. Look at a guitar amp on a large-ish stage or in pretty much any studio, and the chances are it'll have a dynamic mic in front of it. They're rugged and usually have a less sensitive capsule than a condenser mic, so the high sound pressure levels of your amp are less likely to destroy it. This also means that the mic can be placed closer to the speaker, cutting down on your chances of bleed from other instruments. 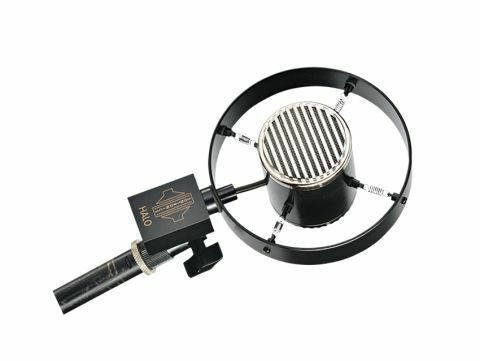 Shure's SM57 has ruled the dynamic roost for decades as a mic for all occasions, but now UK brand Sontronics has developed the Halo, a dynamic mic designed specifically for guitar amps. "As well as looking cool, the mounting system dampens any low end rumble when you're using it onstage." The capsule is suspended in a frame by four springs. As well as looking cool (it's inspired by 40s radio mics, apparently), the mounting system also dampens any low end rumble when you're using it onstage. The frequency response has been tweaked to complement the speakers in your guitar amp; Sontronics reckons this means there's no need for any further EQ, and we'd concur. Once you've set your amp's sound and found a good position, it's fairly transparent but still bright enough to close-mic an acoustic guitar with great results. The shallow design of the mic compared to a 'standard' mic means that it won't stick out as far in front of your amp, which is great for working in tight spaces. It's very well made, but we'd question the frame and springs' longevity in the melee of post-gig packing up.